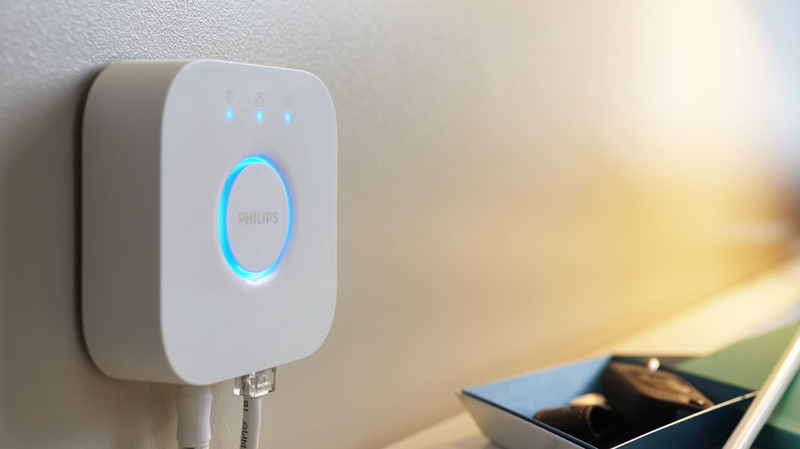 Originally arriving almost three years ago, the Philips Hue app-controllable lighting system was really the first mass market home automation device geared toward iOS device users. The concept is simple – you can select one of more than 16 million possible colors for an LED bulb to display. Along with being able to control the system through your Wi-Fi network, the lights can even be accessed away from home. While Philips started out simple with the popular A19 bulb size, the line has quickly grown and now includes a lightstrip, desk lamps, portable lights, a white-only bulb, and more. And along with the growing hardware lineup, there are now more than 100 different third-party apps that can control the system from an iPhone or iPad. The bulbs can now even change in sync to an Xbox One game and some popular TV movies like the “Sharknado” series. And yes, it’s definitely enjoyable to use. But interacting with the system can sometimes be a pain. You have to open the app or purchase an add-on manual switch to even turn a light on or off. 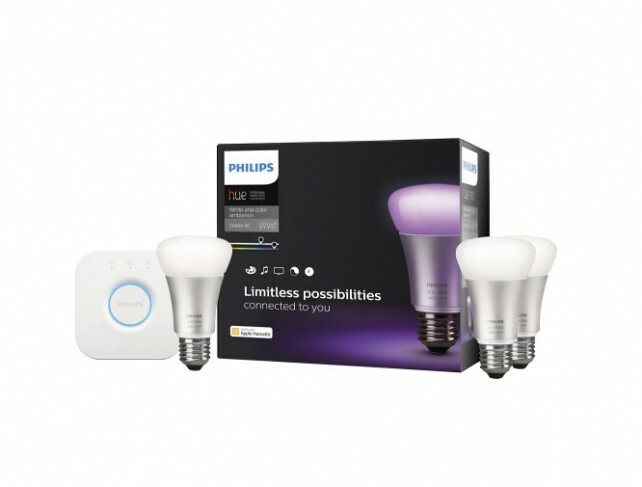 So support for Apple’s HomeKit system always seemed like a natural progression for Philips. Earlier this summer, after the first batch of HomeKit-enabled products began to hit the market, Philips officially confirmed that the Hue lights would support the protocol. And just this month, the add-on Hue Bridge 2.0 hit the market along with a number of new starter kits. Transferring information from the old bridge to the new unit is quick and easy. Since I already had a Hue system installed at my home, I quickly snapped up just the bridge itself. If you already have Hue lights at your home, you will need to follow a few quick and easy steps to transfer the information from your old bridge. 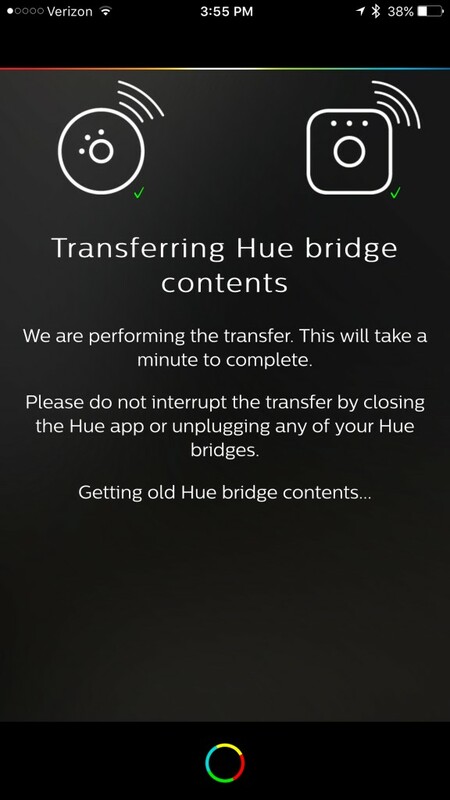 After plugging in the new bridge – which is square-shaped in contrast to the round design of the original – into your router, you’ll need to go through a quick transfer process in the official Hue app. In just a few minutes, you’ll be able to unplug the old bridge and get started with HomeKit. At this stage, you’ll run into the biggest problem with the new bridge – there’s no way to actually set up HomeKit hierarchy with the official Hue app. To really experience the power of HomeKit, you’ll need to create different rooms, zones, groups, and scenes. For example, you can create a room and add a number of lights to it. Instead of interacting with the lights one by one, you can ask Siri to “Turn off all of the Living Room lights.” So that’s disappointing, and something Philips will hopefully rectify in the future to make the HomeKit process more transparent for new users. In the meantime, if you’re ready to actually take the plunge now, go ahead and download the Elgato Eve app. While it’s actually made to control the line of HomeKit-enable devices from Elgato, there’s a nice side affect I learned when I reviewed the Eve Weather back in September. 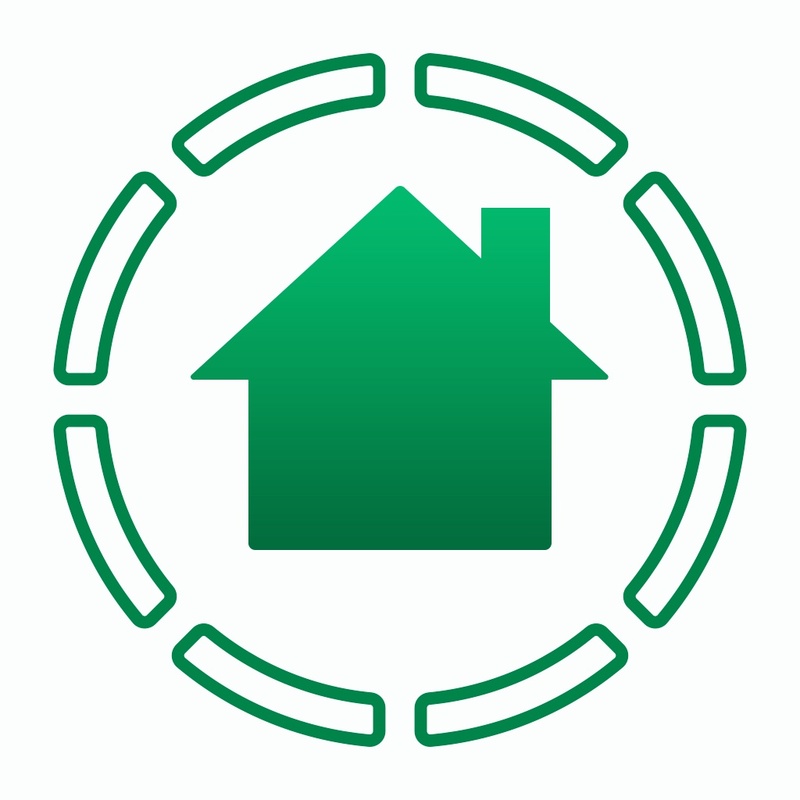 The app can be used to control all HomeKit accessories, no matter the manufacturer, and also set up your entire house from the ground up. Once you’ve set everything up, the fun can finally begin. Using Siri, there’s a surprising amount of features you can control. 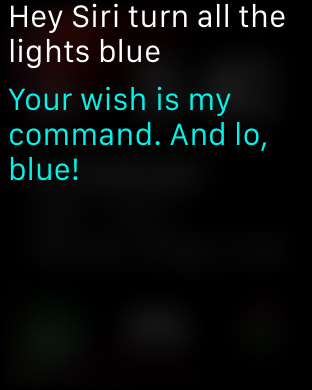 Along with the usual on/off and brightness requests, you can even change the color of your lights through Siri. 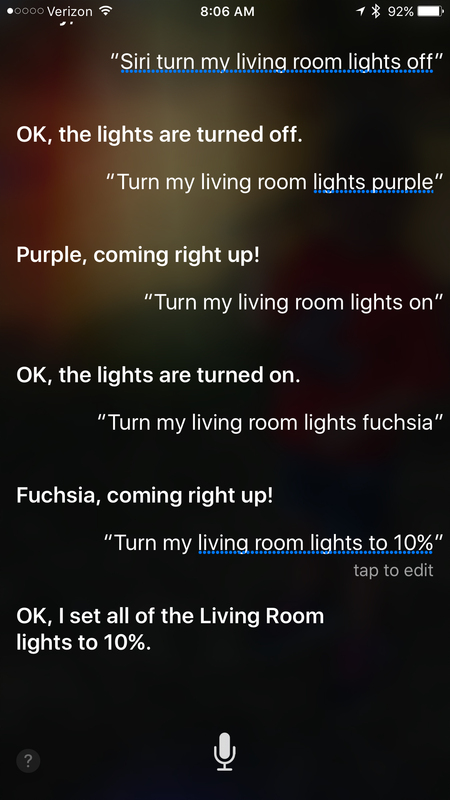 And while the personal assistant doesn’t exactly recognize 16 million color names, you can ask the Hue lights to switch to some obscure color names like fuchsia. Some examples of some Siri commands you can use to control the lights. And using the watch, as long as you’ve updated to Watch OS 2.0, just raise your wrist to issue Siri commands to control the Hue. Even the Apple Watch can get in on the fun. You can also use Siri commands to activate the different lighting scenes that can be set up through the Hue app. Just to note, there’s a big caveat if you’ve been using the Hue system with the popular Amazon Echo. If you’re not familiar with the Internet-connected speaker, make sure to definitely read The Weekly Echo column from my colleague Jeff Byrnes that rounds up what’s new with the device. But with the original bridge, the Echo can sense the Hue lights. And just like with HomeKit, you can control the lights with a simple voice command to the speaker. After installing the new bridge, I attempted to reconnect the lights with my Echo, but to no avail. And after a bit of research, I found that I wasn’t alone. It will apparently take some significant work from both Amazon and Philips to offer Echo support for the new hub. That may or may not happen any time soon, if it all, because of the high level of encryption Apple required for any HomeKit-enabled products like the new bridge. The new bridge is also available in a Hue starter kit that retails for $199.99 and contains three A19 bulbs. But if you’re fully immersed in the Apple ecosystem, HomeKit support really adds a new level of fun and usefulness to the entire system. Definitely pick up the new bridge if you’re ready to experience a glimpse of the smart home future – at least according to Apple. If you can wait until Nov. 1, Philips will be offering a nice deal for current Hue users that will allow them to pick up a bridge for $40 instead of the full retail price. And if you’ve been on the fence about purchasing a starter kit, the added functionality is definitely worth a look – especially if you’re using an iPhone 6s or Apple Watch. Truly adds a new level of usefulness to the already wonderful app-enabled lighting system. Once it’s configured, it is simple and easy to use. Especially handy for iPhone 6s and Apple Watch users thanks to the “Hey Siri” functionality. Along with brightness and on/off commands, you can even change the color of the lighting. Breaks compatibility with the popular Amazon Echo Internet-connected speaker. There’s no way to manage a HomeKit hierarchy and create rooms, zones, scenes, or groups with the Philips Hue app itself. 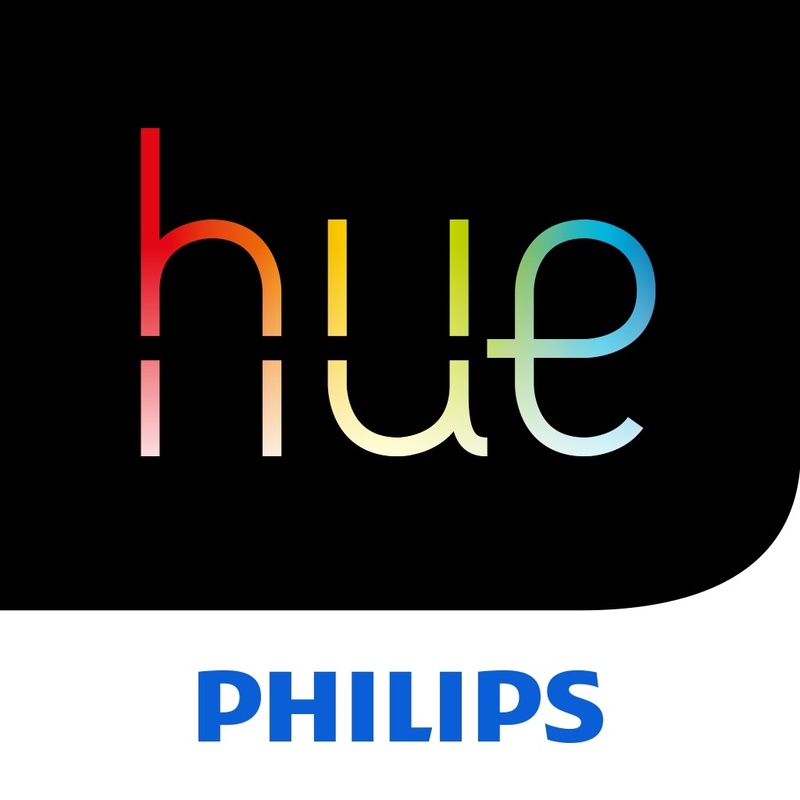 Starting Nov. 1, current Hue owners can purchase a new bridge directly from Philips for $40. You can read more about that program here.